Black on black matt black sleeve with spot gloss text and black inner. Limited edition 1000 copies worldwide. 300 copies were sold via Bleep, the rest from the Touched bandcamp directly. Despite being advertised as 180g, this record is not 180g. Play It at 33 RPM !!!! ::!!!!! !!!! If you haven’t seen the news already then you possibly live in a cave. Or like me, your internet is down and you’re relying on messenger pigeons to communicate in 2017. 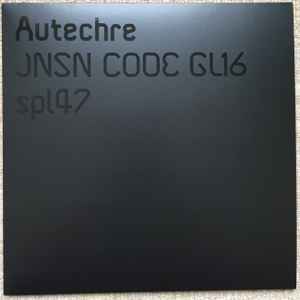 In an epic move, Touched Music is pleased to be able to offer you a brand spanking new 12” from legendary artists Autechre. Limited to 1,000 copies, Touched Music join the very short list of labels who have the honour of serving up the chaos that only Brown & Booth can provide. Consisting of two tracks, previously-contributed to the epic Touched compilations in 2014 and 2016 respectively, only ever available digitally and freshly remastered for your favourite analogue medium. And what a pair of tracks they are too. Whether you drop the needle in your living room or on a dancefloor there’ll be barely enough time for anyone to get their senses in order before the fun starts. Oh the marching onslaught that is ‘spl47’. Relentless in pace and unforgiving in its transitions, it cares not for your musical sensibilities, your tinnitus or your weak heart. It is here and you shall experience it. ‘JNSN CODE GL16’ is more forgiving, something that wouldn’t have sounded out of place in the middle of the 2010 album ‘Oversteps’. But it’s still not going to let you off the hook and offers up much of the same love we have come to expect from the Rochdale duo. Available from Touched Music directly or the Bleep music store, grab yours now before they run out and inevitably become a sought-after collectors’ piece, helping the fantastic cause of Macmillan Cancer Support along the way." Great record first and foremost. Out of the blue but always nice to feed your head on some new Autechre material. As a side note wouldn't it be nice if discogs could build into their platform a new section for people who do nothing but rant on about 'flippers' and 'sharks' so there would be a more informative and constructive reviews section based solely on the music and it's artwork. Almost every time a limited edition sells out the wave of abuse comes flooding in. In this case it really detracts from the hard work put in raising money for charity. This is a great release, side B harks back to Untilted at one or two moments to my ears. Must say though, my copy certainly doesn't feel like 180g vinyl. Not complaining mind, just wondering if anyone else found this?